Don and Wilma Corbett, still showing their youthful enthusiasm at their ARIC Visit 7 examination, June 2018. Don and Wilma Corbett have been participating in The Atherosclerosis Risk in Communities Study for over 30 years, assisting researchers complete tests such as: grip strength (left photo), walking speed (center photo), and echocardiogram (right photo). Thanks to their dedication, the results from this research will provide the breakthrough data that will inform disease prevention for many more years to come. 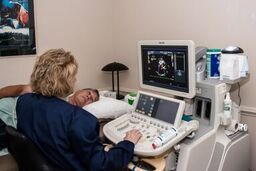 ​ARIC/ACHIEVE Participant Joanne Weicht receives an echocardiogram from ARIC cardiac sonographer, Darlene Frankhouser. Meet Fred Householder, 1st Participant for ARIC Visit 7! ARIC Participant Fred Householder has the honor of being the first person seen for ARIC Visit 7! ​Reverend George A. Limmer has been a loyal and active participant since he was enrolled into the ARIC Study in March of 1987. 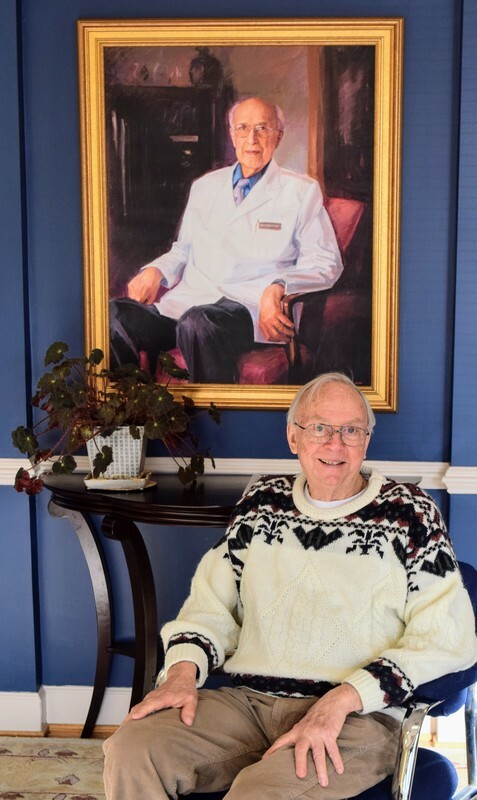 Throughout his long career at St. Mary Catholic Church, and even into his busy retirement, Reverend Limmer still finds time to participate in all of his semi-annual telephone calls and ARIC Exam visits.